If you are new to Bibliophilia, Please, you may be asking where the awkward comes in to this post. If you happen to be anyone who knows me the slightest bit, you will know that I am awkward. Very awkward. You will feel awkward while communicating with me at times. Am I a psychopath? No, I just don't take social cues very well because I live in LaLa-Land. And people terrify me. For real. Another reason this is awkward because I'm pantsing the posts this year. I always mean to write these ahead of time, but something always seems to come up. I'm having some health and family issues right now (nothing to worry about - I'm fine), so I'm behind on ALL THE THINGS, this included. A is also for Arlee Bird today. 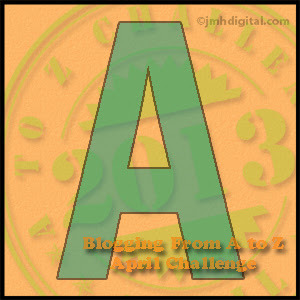 He started the Blogging A to Z Challenge, and he blogs over at Tossing It Out. Thank you so much, Arlee, for all of your hard work on BA2Z! Great post. Good luck with the posts. I understand your awkward. I don't always catch cues until I've already responded to them - in the wrong way. Awkward people unite! This is my first A to Z year and I was planning on writing some posts ahead of time, but here I am on the first and nothing is done lol. Looks like I will be pantsing too. I kinda love the term "pantsing." I'll admit I haven't heard it before but it's clever! Great start...and I'm considering picking up Raw Head and Bloody Bones, too. Sounds intriguing. Whew! I thought I was the only one winging it with posts! I felt very awkward :) because everyone in the challenge seemed to have their sh*t together and I so don't! Good luck to the both of us!